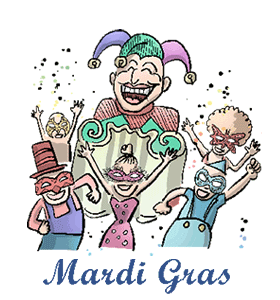 ﻿Mardi Gras: Calendar, History, Tweets, Facts & Activities. Mardi Gras marks the end of the Carnival season, a period observed by many Roman Catholics that starts at Epiphany on January 6 and ends on the Tuesday before Ash Wednesday (Mardi Gras). Since Mardi Gras is the last day before lent (a solemn period observed by prayer, repentance, fasting, and moderation), it is often associated with lavish Carnival-like celebrations. Some families eat a festive King Cake on Mardi Gras. Although it is traditionally served on Epiphany, many cultures, especially the people of Louisiana, savor the sweet cake the night before Ash Wednesday. Mardi Gras cakes are often decorated with a toy baby to represent the baby Jesus. Although the holiday is rooted in the Christian calendar, not many churches observe it with a worship service. Most observances include festive parties, balls, and parades. Green, gold, and purple are the official colors of Mardi Gras, and they all have roots in Christianity. Green represents faith, while purple symbolizes justice. Gold stands for power. Mardi Gras is not celebrated as an official church holiday, but is celebrated because the following day starts Lent, a 40-day period of preparation and penitence before Easter. Ash Wednesday marks the beginning of Lent, so Mardi Gras, French for "Fat Tuesday", is often the last day that people may indulge before beginning dietary restrictions. In Roman Catholic tradition, the faithful refrain from eating meat during Lent except on Sundays. Fish is acceptable in some Latin American countries. Attend the largest Mardi Gras celebration, in New Orleans, Louisiana. Make your own King cake and serve it to your family and friends. Wear purple, green, and gold beads to celebrate the day. Attend a local Mardi Gras event. Many local communities organize street fairs and celebrations for this day.